Peacocks are showy, flashy birds known for their large tail plumage, brightly colored heads and proud avian strut. From the pheasant family of birds, peacocks are the male version of the group known as peafowl (the females are called peahens), and are famous for their large courting display of billowing tail feathers covered in blue-green "eyes." Though available in a wide variety of colors and sizes, peafowl are comprised of only three species of birds. Peacocks are the male of the species of peafowl, birds known for their showy plumage. There are only three species of peafowl: Indian, Green and Congo. They are distinguished by their color and size. The most recognizable peacock species, the Indian peacock is native to India, Sri Lanka and other parts of eastern Asia. The peacocks of the species display the famous tail plumage used in courting rituals and have bright, blue heads and crest colorings. The bright coloring and large tail feathers are used to attract peahens and size up against other peacocks. Indian peahens are a muted brown color with green or blue heads and smaller tail sections that serve as camouflage when caring for peachicks under bushes or foliage. The Green peacock, also known as the Javanese peacock, is native to the Indonesian island of Java in southeast Asia. Green peacocks are similar to Indian peacocks in that they have large, brightly colored trains and use the feathers in courting rituals. The heads and crests of green peacocks are a deep green color rather than blue, making them distinguishable from Indian peacocks. Green peahens are also brightly colored with green hues that are only slightly more muted than their male counterparts, however, like Indian peahens, the green variety does not have a long train of tail feathers. A relatively recent discovery, the Congo peacock is an African native that more closely resembles typical pheasants than their flashy peacock brethren. Absent of elongated, brightly colored trains and colored blue, the males are of small stature compared to other species. The peahens of the Congo are dappled green and brown, resembling young versions of green or Indian peacocks. Though not much is known about the endangered Congo peafowl, the Association of Zoos and Aquariums has set up a program to help preserve and maintain their habitat and populations. 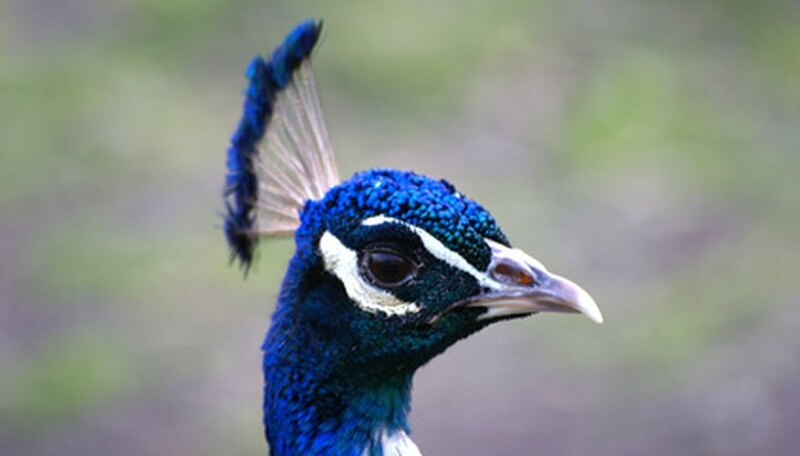 Through selective breeding and mutations, peacocks exist outside of the normal realm of Indian and green peacock coloring. The white peacock is not an albino, but rather a product of leucism (dimming of skin and feather pigments) and is entirely white from crest to train. Other breeding variations include peacocks that are black, brown, yellow and purple; all are simple variations or mutations from standard green or Indian peacocks. Carrie, Chet. "Types of Peacocks." Sciencing, https://sciencing.com/types-peacocks-7340346.html. 05 April 2018.